San Juanita Elizalde, 66, was born September 13, 1951 in Nuevo Laredo, Tamaulipas, Mexico and passed away June 10, 2018 in Webster, TX. Mrs. Elizalde moved to the Houston area in January of 1974 and worked for Pediatric Clinic of LaPorte for 18 years; she had a very strong work ethic that she instilled in her family. San Juanita was a member of St. Helen Catholic Church. She had a tremendous impact on everyone she knew; from the people she worked with and the children she took care of on a daily basis to the many family members that loved her so dearly. She was the heart and soul of the Elizalde family. Her faith and her family were the most important things in her life, and she passed these values on to her children. Her relationship with God was very important and the bedrock of her existence. She enjoyed camping trips and holidays; she made it a point to bring the family together and made sure all of her children loved and cared for each other. The legacy she leaves behind has no end. She is preceded in death by her parents, David and Cointa Pineda. 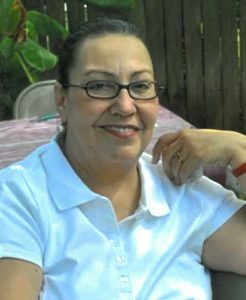 Mrs. Elizalde is survived by her husband of 47 years, Francisco Elizalde; daughters: Judith Vasquez, husband Emerico, Jessica Perez, husband Robert and Lindsay Martin, husband Jason; sons: Francisco Elizalde II, Bryan Elizalde, wife Judy and Victor Elizalde, wife Cynthia; grandchildren: Isaac Vasquez, Belicia Vasquez, Aaron Vasquez, Cathy Kaisler, Samantha Kaisler, Elijah Perez, Noah Perez, Jaxson Elizalde, Logan Elizalde, Chloe Elizalde, and Bianca Elizalde; brothers: David Pineda, Martin Guerra, wife Elisa and Jose Guerra. A visitation will be held from 5-8p.m. Thursday, June 14, 2018 with a rosary to begin at 6p.m. at Crowder Funeral Home in Pearland. Funeral service will be Friday, June 15, 2018 at 10a.m. in the chapel of Crowder Funeral Home. Burial to follow at Forest Lawn Cemetery. The post San Juanita Elizalde appeared first on Crowder Funeral Home.